When environmental engineer Barry Cik went to a baby store to buy a crib mattress for his first grandchild in 2003, he was concerned by what he found in the products: a wide variety of toxic chemicals including vinyl and PVC with phthalates, polyurethane foam with flame retardants, formaldehyde, glues, and more. Right then and there, he knew he had to build a better product. He went on to found Naturepedic with his sons, starting with baby mattresses and then moving on to adult mattresses, sheets, mattress pads/toppers and pillows in response to consumer demand. “Babies and toddlers spend up to 12-15 hours a day on their crib mattress, and even as adults, a third of our lives are spent sleeping. The chemicals we are exposed to during that time affects us the rest of our lives, so as a business owner it’s necessary I do the right thing from the beginning,” Cik says. He decided that everything from field to finished product would meet organic, non-GMO, and non-toxic standards. For example, Naturepedic uses only organic cotton, organic wool, organic kapok, and organic latex as the cornerstones of its products. But the company doesn’t stop with just certified components. The finished products also are certified to the most stringent organic textile processing standards that exist – the Global Organic Textile Standard (GOTS) for the cotton, kapok and wool, and the Global Organic Latex Standard (GOLS) for the latex. These standards prohibit the use of toxic inputs during the manufacturing stages, and ensure that workers throughout the Naturepedic supply chain – including the predominantly Amish people in the factory – are taken care of. 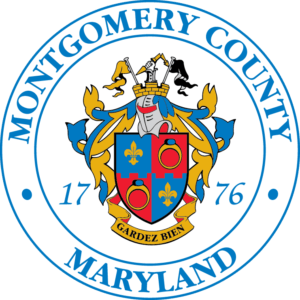 Once Naturepedic opened its store in Montgomery County – its 17th nationwide – it learned of the county’s Green Business Certification Program. Naturepedic requested that GOTS be added to the unique program which recognizes a suite of stringent standards that protect both the environment and workers. In December, 2018, the county adopted the standard – becoming the first U.S. jurisdiction to do so – and Naturepedic became the first company to become certified to the Green Business program on the basis of GOTS certification. 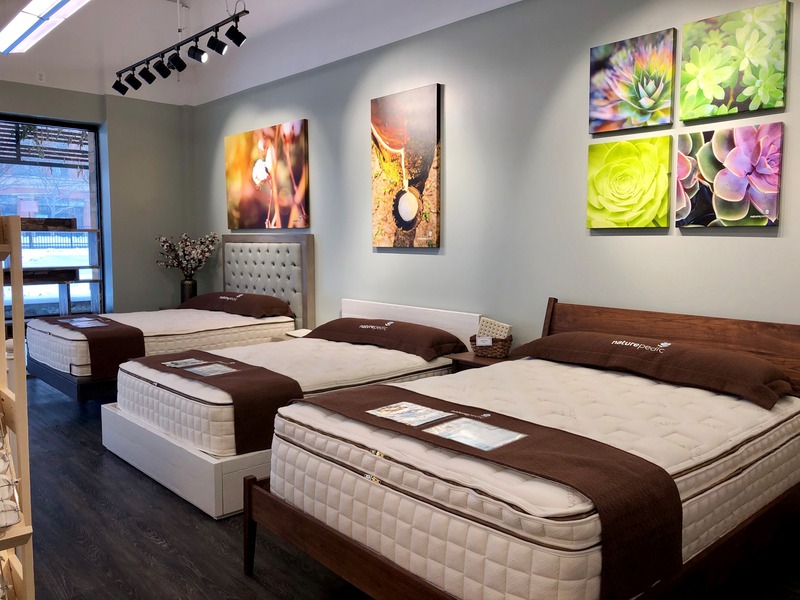 Naturepedic is the only GOTS-certified mattress company in Maryland and Washington, DC. Naturepedic puts a lot of care into every step that goes into making the finished products. 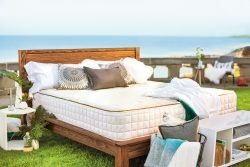 For example, one of the most unique aspects of Naturepedic’s products is that the majority of its mattress models enable consumers to choose the density they wish to have on their side of the bed, and then purchase only that pad in the future if and when it needs replacing. There’s no need to buy a whole new bed! Wood: the wood in the beds is Forest Stewardship Council (FSC) certified, and the wood used for the hand-crafted bed frames sold in its stores comes from reclaimed lumber – including old Douglas Fir and redwood – saved from California landfills following demolitions. Waterproofing: The food-grade polyethylene and PLA, used for waterproofing and inner cores in its lightweight baby crib mattresses, come from non-GMO sugarcane. Energy use: Naturepedic offsets 100% of its electricity use by Renewable Energy Credits (RECs) purchased from Green-e certified provider NativeEnergy. In addition, energy used for lighting is minimized by having 13 skylights using natural light, energy-efficient lightbulbs, and even drop lighting – chain-supported overhead factory lighting which requires fewer lights to illuminate an area. Carbon footprint. The handcrafted nature of its products means the use of more traditional tools, powered both by hand and by compressed air, reducing the carbon footprint. Flame retardants: Naturepedic meets federal flammability standards without the use of flame-retardant chemicals of any kind, by using naturally flame resistant organic wool. Packaging materials: Most of Naturepedic’s cardboard packaging is 100% recycled content. 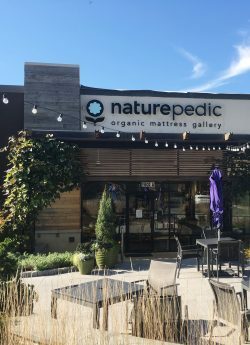 To prove that Naturepedic’s corporate office and its North Bethesda showroom are taking these steps, both locations are certified to the Green America Gold Standard. While Naturepedic leads the pack in healthier mattresses, the company doesn’t measure its business against the competition, but against its own potential. Naturepedic will continue to push to become even more sustainable in the years ahead. The Naturepedic Organic Mattress Gallery is located at Pike & Rose at 11802a Rockville Pike.